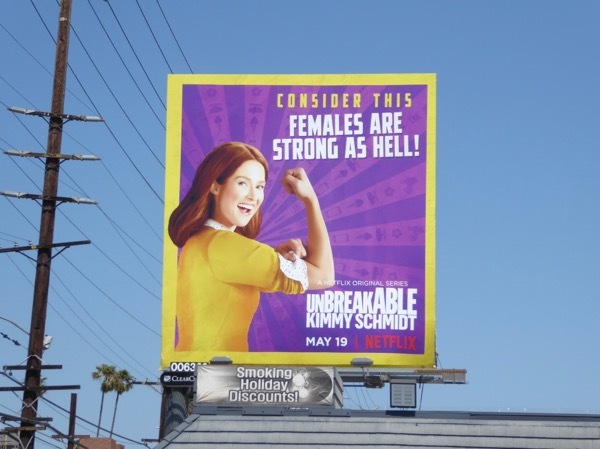 The Unbreakable Kimmy Schmidt is back for her third season and it looks like her positive spirit is as undaunted as ever, rolling up her sleeves and striking a Rosie the Riveter-like pose paying homage to the 1940s U.S. wartime propaganda poster 'We Can Do it' by J. Howard Miller. 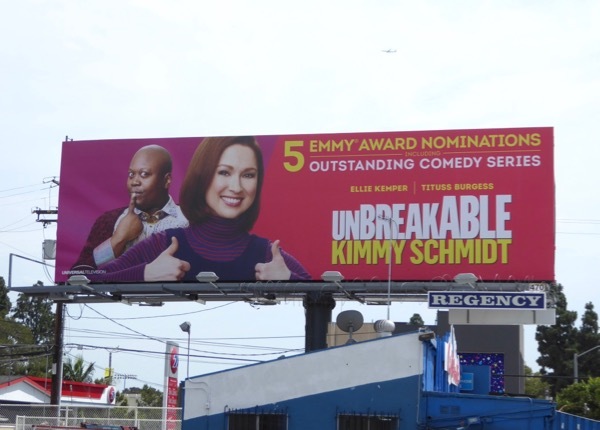 Kimmy's boundless enthusiasm, naiveté and joyful exuberance are just what we need during these dark times to help us resist the waves of negativity sweeping the nation. 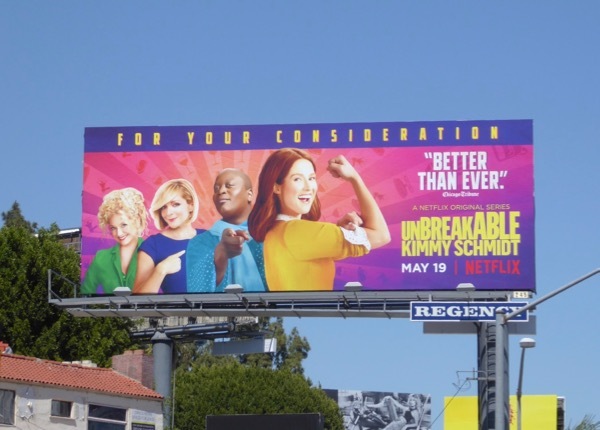 This season Ellie Kemper's 'Kimmy' is off to college whilst her roommate 'Titus Andromedon' (Tituss Burgess) is back from singing on a cruise, their landlady 'Jillian' (Carol Kane) continues to resist the gentrification of her New York neighbourhood and Jane Krakowski's socialite 'Jacqueline White' continues to have a life full of drama. 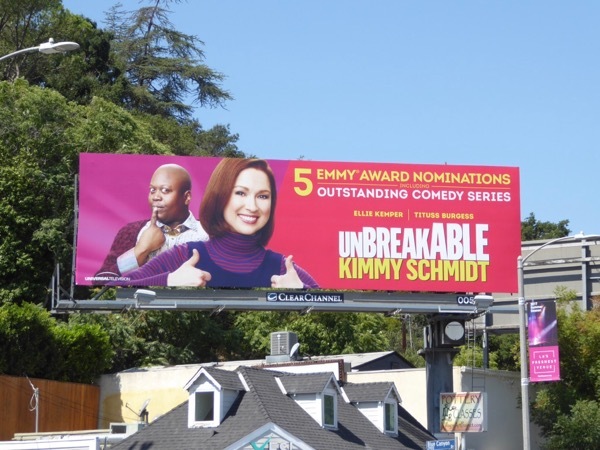 Plus expect a whole host of guest stars to drop by in each episode. 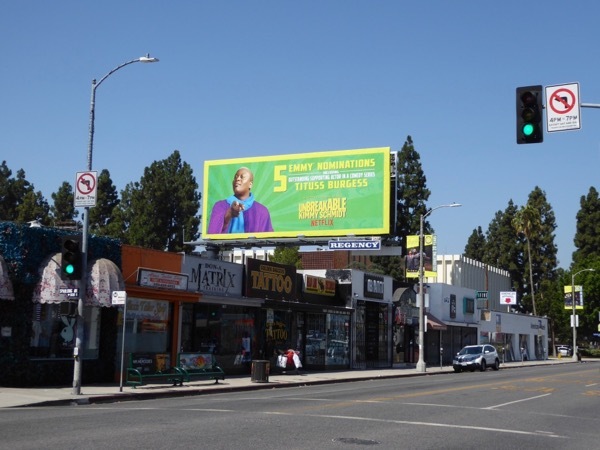 These colourful season three billboards were snapped above West Hollywood's Sunset Strip on May 18 then the next day in multiple locations in different formats along Santa Monica Boulevard in West L.A. 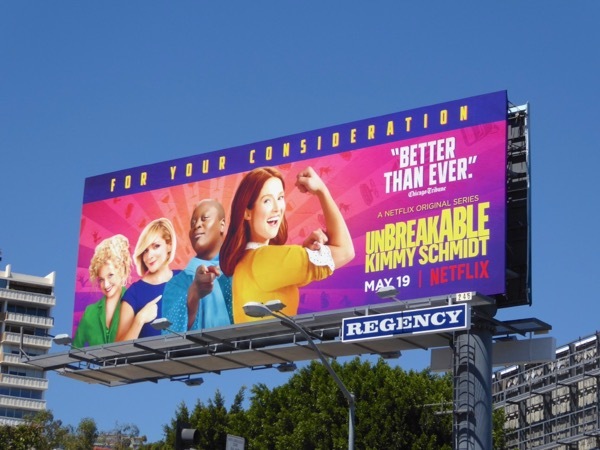 This year it also looks like they are combining the season launch billboard with their Emmy Awards consideration efforts compared to previous years when they've had hilarious outdoor Emmy FYC ad campaigns for the comedy filling the city skies. 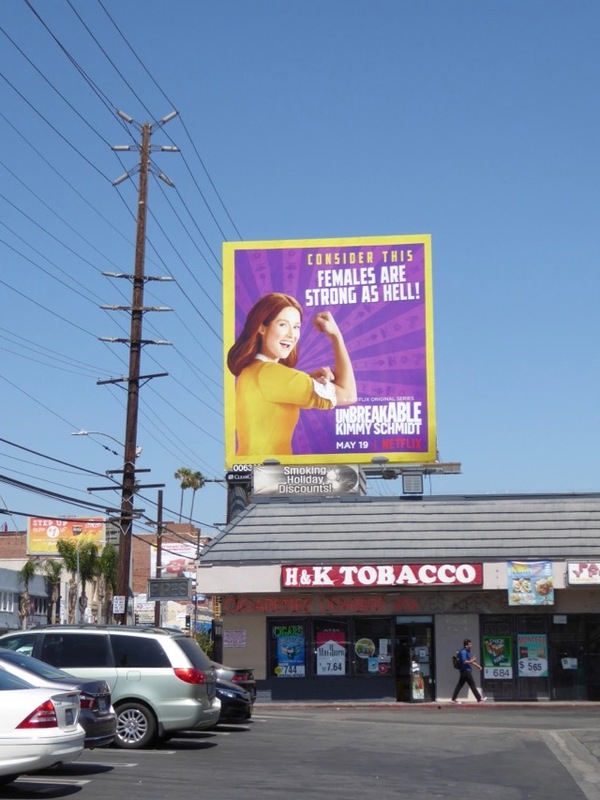 Plus for more Rosie the Riveter-inspired ad creatives be sure to check out these billboards for Bomb Girls and more. 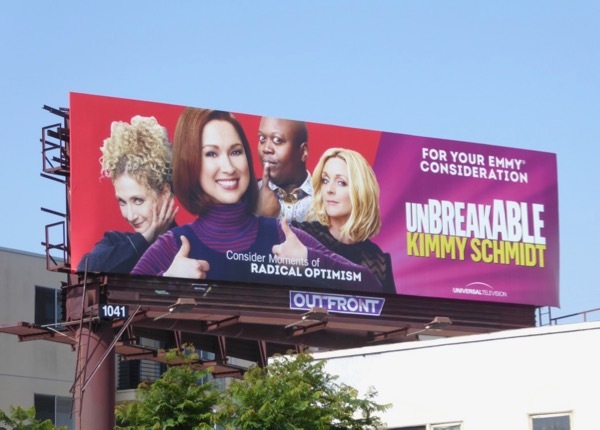 When you think about it Kimmy's not doing so bad for someone kidnapped and kept captive underground for years. Let's all take a leaf out of her book and live life with more optimism, so no matter what the world throws at us, we can rise stronger than ever each day. UPDATED: Here's another empowering ad creative for the third season which clearly emulates Rosie the Riveter. 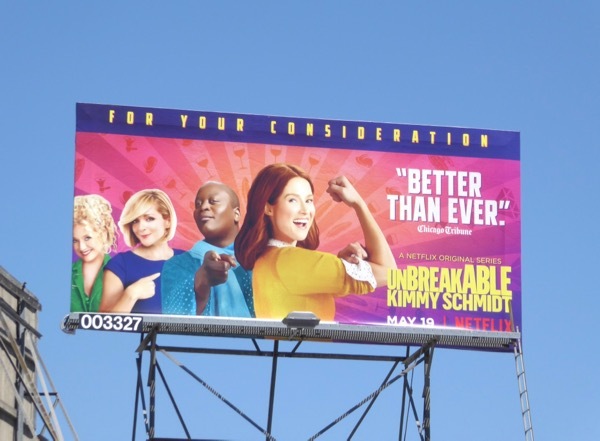 This solo Kimmy version was spied along Santa Monica Boulevard at Vine Street in Hollywood on May 27, 2017. 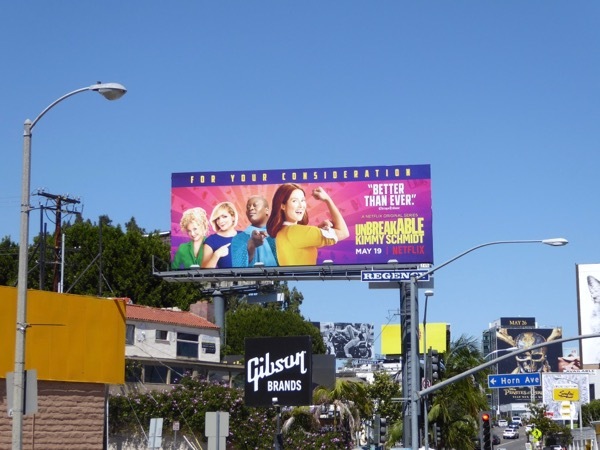 UPDATED: Here's also Universal Television's Emmy consideration billboard for the third season with all the gang, snapped along Fairfax Avenue on June 1, 2017. 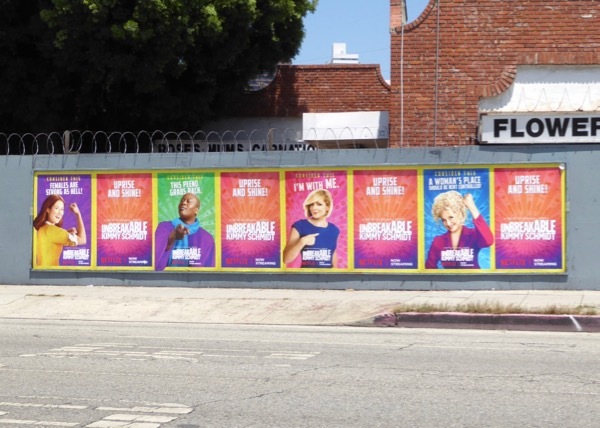 And here's also some colorful Resist-style street posters for the third season showcasing the rest of the cast spotted along Santa Monica Boulevard in West L.A. on June 9, 2017. 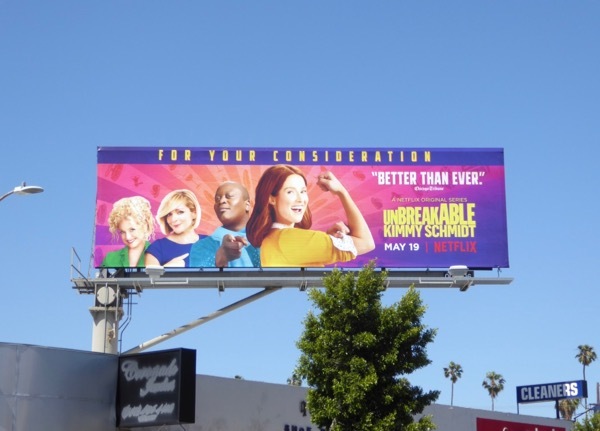 UPDATED: Here's also an Emmy nominations billboard for the Netflix comedy which garnered five nods, snapped along Fairfax Avenue on August 2, 2017. 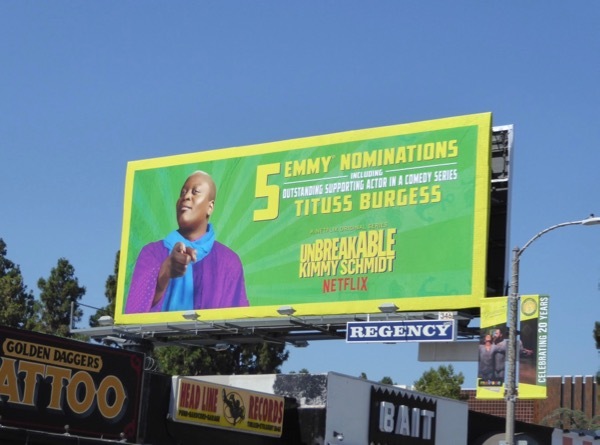 Plus here's also a solo billboard for Tituss Burgess and his nomination for Outstanding Supporting Actor once again, snapped along Melrose Avenue on August 9, 2017. 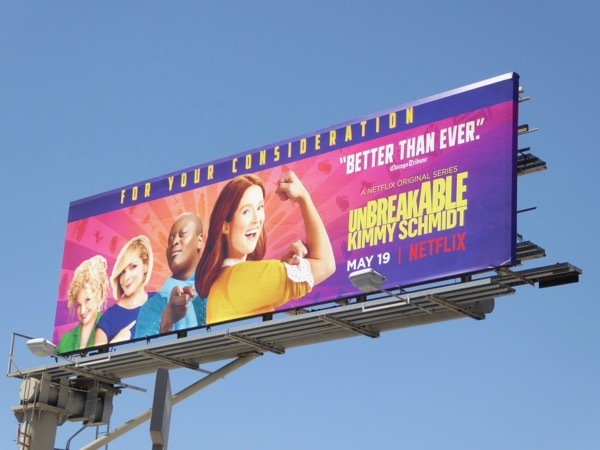 Over three seasons the Netflix comedy has scored sixteen nominations with no wins so far, will 2017 be its lucky year? 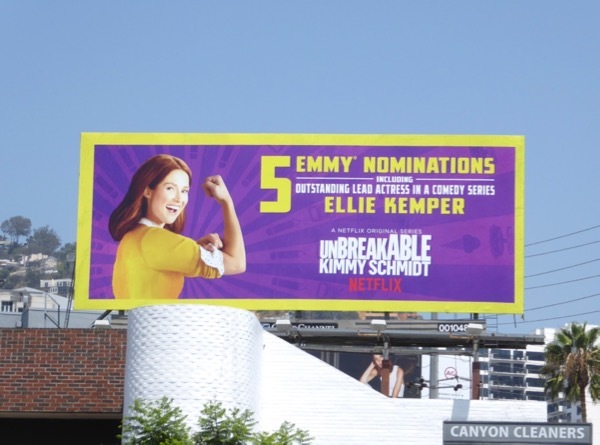 And not to be left out, here's the ever optimistic Kimmy herself, aka Ellie Kemper, with her own solo Emmy billboard. 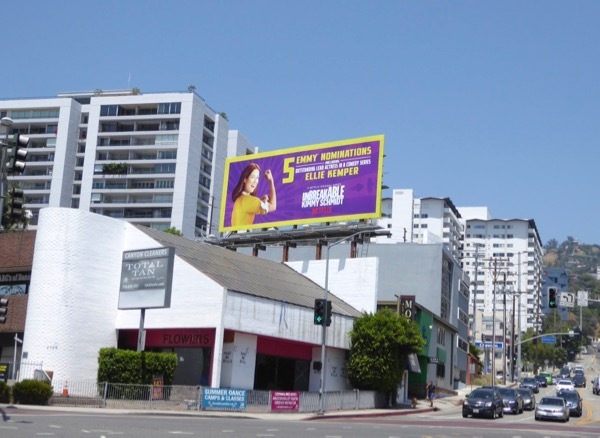 This nominations billboard was snapped proudly standing out above Santa Monica Boulevard in West Hollywood on August 10, 2017. 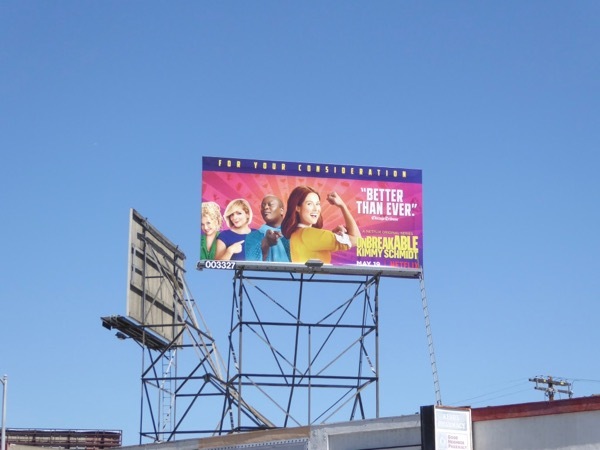 UPDATED: Here's another example of the Universal Television Emmy nominee billboard spotted along Ventura Boulevard in Studio City on a sunnier August 22, 2017.